My ultimate aim with this blog is to provide really useful and relevant support to people across a broad range of life hurdles, whatever they may be. However, I’ve also decided to create a series of articles which will be a little more focused specifically around my personal experiences of Multiple Sclerosis and the health hurdles I’m trying my best to survive. Why am I creating this series? Because I know first-hand what a shock it is to experience your first big relapse or receive that dreaded life-changing diagnosis. I know just how alone you can feel and how strong your desire to find the answers and solutions to your health struggles can be- they must be out there somewhere, surely? I know some of the daily realities and the indignities you can face and hard decisions you never thought you would have to make; potentially life-threatening treatment options anyone? I know just what it can be like to be scared for your future and to feel like you’re losing control of your own life; goodbye oh-so-carefully-crafted 5-year plan! I also know that, once you get past the initial shock, how you have to get on with life the best that you can, whatever it may look like following that BIG relapse (or even worse- a seemingly never-ending series of BIG relapses) and to stop being in denial about the changes you need to make. So if I can help anyone else who is also experiencing any of the hurdles explored within this series of articles that would be an amazing achievement! After all, no one should feel like they are tackling their hurdles alone. Of course everyone experiences MS differently so there is definitely no one-size-fits-all approach to dealing with this condition but sometimes just feeling like you have support can make getting through it all a bit easier to begin with. You may instead be suffering with other health conditions which present some of the same symptoms or generate similar feelings to those I mention within these articles. You may be a relative or friend of an MS sufferer who wants to better understand what the person you care for could be experiencing (if so you are amazing and I’m sure your friend/relative will appreciate everything you’re doing for them). You may just be curious and interested in finding out more. Whatever your starting point, I really hope you find my MS hurdles series truly helpful and insightful. Also, please feel free to leave a comment if you identify with any of the issues I explore or have any of your own experiences you would like to share. The simple truth is that before my diagnosis I was a very different person. A more confident person who had a plan and was sticking to it. I had a career which was hard work but rewarding, I’d started a family and was beginning to think about having a second child, I’d just brought a new house to give us more room (ready for that second child), I’d built up savings and could afford everything I realistically needed. Looking back though now I have to admit that although (in my opinion) I was usually a nice person I was also a bit ungrateful and selfish, taking everything that I had for granted and I had maybe lost sight of some of the more important things in life. Being diagnosed with a life-changing illness was certainly a wake-up call for me, especially as my diagnosis was triggered by a large relapse which impacted on my life significantly. I think though that there are many reasons why receiving a MS diagnosis can be a difficult time; it is in fact shocking, emotionally draining and very scary; nothing can properly prepare you for it. It can also be illuminating and help to explain the unusual symptoms you have been experiencing for months or probably even years. Especially as sometimes the path to diagnosis can be long and frustrating as, unfortunately, fighting your own corner and insisting that your health concerns are taken seriously can be all too necessary. Prior to my diagnosis I had an underlying feeling that something wasn’t quite right. The difficulty is though that you can only truly know yourself and the way you are feeling and you don’t really have anything concrete to compare your feelings against so you start to think that maybe your symptoms are normal, you are being over-dramatic, they can be explained away or you self-diagnose (particularly if your GP clearly thinks you’re a time waster). For years I convinced myself that when I got a cold and my balance got worse that my inner ear was just susceptible to infection, I also thought that my fatigue and need to rest frequently was either a sign of laziness or mild depression, I thought that I was just being over dramatic when I got ill as other people seemed to be able to power through it so why couldn’t I? Even when I had a relapse which slurred my speech and made my fingers slightly numb I managed to convince myself it was an unusual yet powerful virus, after all when I googled my symptoms and MS popped up as a likely culprit (along with loads of other scary potential causes) I told myself I couldn’t be that ill, that life-changing illnesses happened to other people, that I was over-dramatizing my situation, my GP had never thought anything of my symptoms in the past so I shouldn’t waste their time and if I ignored it maybe it would go away! Due to the nature of relapsing remitting MS (the type I have) it did go away on the whole and for a while, probably aided by a pregnancy which helps to reduce relapses. However, WOW did I know it when my MS fully returned fiercer than ever. The impact of my next relapse was huge and after about a week, when I eventually admitted to myself that I had a serious problem which wasn’t going away, my partner convinced me to seek help. I was told to go directly to A&E, although at this point I was still convinced I would be wasting mine and the Dr’s time. However, my symptoms were initially considered unusual and serious enough to warrant immediate further investigation so I was asked to wait for a Neurologist to assess me further. It was then that my unknown illness suddenly started to feel very real. Fear started creeping into my conscious thoughts more rapidly at this point- others were starting to take my symptoms seriously so maybe it was time I had to face them too. This was made significantly worse when following the Neurologist’s assessment he admitted me to hospital for further tests. It’s hard not to let your mind wander to a terrifying place when faced with the prospect of being confined to a hospital ward with an unidentified, serious illness. I’m not a brave person; a part of me had definitely started to panic and let me tell you- a neurological ward isn’t exactly the most relaxing or comforting place to be, although on the plus side I became grateful for all the positives I did have in my life pretty quickly! Over the course of a week I had one CT scan, two MRI scans, one chest X-ray and one lumbar puncture. When he wasn’t with me, I missed my 11 month old son like crazy and it was the most anxious, boring and surreal week of my life. I did, however, meet some fellow MS suffers whilst I was in hospital, who shared with me their experiences, symptoms and most importantly what life with MS looked like for them. It wasn’t long before I started to put two and two together and realised that based on my symptoms and the test results I’d received so far that it was very likely that I also had MS. I think this definitely went some way to softening the blow when the consultant confirmed my thoughts, although his delivery of the outcome was certainly lacking in many respects. If it hadn’t been for the down-to-earth support from a fellow MSer in hospital I think I would’ve felt totally adrift. I thought I’d initially handled my diagnosis quite well, after all MS is a chronic illness but it most definitely could be worse and at least I now knew what illness I was dealing with. The hardest thing to do next was share my news with close family and friends. Upon witnessing their tearful and/or downbeat reactions my positivity started to falter; they were really scaring me and I couldn’t help but have a good old cry at myself. Maybe my life was over after all? Maybe I would need a wheelchair soon? Or maybe I just needed to get a grip and stop thinking about the ‘what ifs’ and get on with my life! Three days and three doses of steroids later I was out of hospital and trying to do just that- and failing quite spectacularly, I might add! Looking back, I do think that if I’d known how much MS would take from me and how hard my (partial) recovery would be that I would have been even more upset at the time of my diagnosis. Also, I probably would have pushed a lot harder to get the right treatment and medical assistance sooner. So there you have it; a record of my MS diagnosis and the start of a whole new life for me. Even now it’s hard to write without getting a bit emotional! 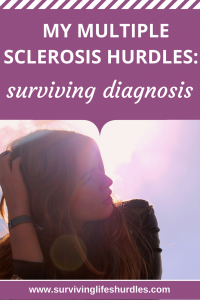 As I mentioned, this is part of a series I’m writing about my MS hurdles as there are plenty of ways MS has impacted on my life which would be good to share. I know myself how little information there is available beyond the medical fact sheets, which are useful but leave you asking how it all translates to real-life and how others are managing to live with this condition. Other popular articles from my MS hurdles series include what day-to-day life is like for me with MS and my experiences of taking Tysabri as a treatment option. I really hope that my own story of being diagnosed with a life-changing illness is helpful to you and your situation and I’m wishing you all the best for the rest of your journey. Can you relate to any of the experiences I’ve had or the feelings that I’ve shared based on your own diagnosis? It’s my pleasure, I love the link up party so thank you for hosting it! I can relate. I too thought some of the strange things going on with me were just a virus, working to many hours, not getting enough sleep. Now looking back I realize that these things were much more and I had been having symptoms for years. I know, I can’t believe some of the symptoms I ignored! Thank you for following me, I’ll be following your blog too, you are so inspirational and I can really identify with a lot of your experiences.